Artichokes with Mayonnaise, Thyme for Cooking seasonal vegetable first course. 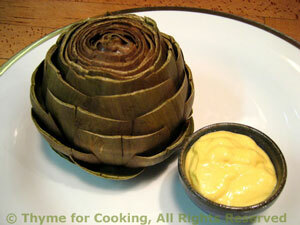 Globe artichokes can be stuffed, or cooked and served as a vegetable. Or simply eaten our favorite way: steamed, dipping the leaves in something slightly decadent. The artichokes take about 45 minutes to steam. This can be done anytime and served warm or cold. They are done when an inner leaf pulls out easily. Whisk everything together well. It should keep the consistency of the mayonnaise, maybe a bit less stiff. Divide into 2 small bowels to serve.